In this list, you can find the best truth or dare questions for teenagers. You can try these questions when you are playing truth or dare game with your friends or with your family. 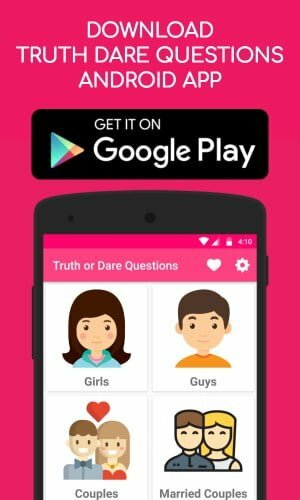 Enjoy our truth or dare questions for teenagers and have fun. Who is your favorite celebrity? Why do you like him/her most? Do you ever try to solve the problems between your best friend and his/her crush? Do you ever apply makeup without using the mirror? Have you ever admired your best friend if he/she get good marks in the examination? Have you ever try to sing tongue twister in a musical way? Tell me your weirdest habit? Do you have crush on any of your school teacher? Who is the most annoying person among your friends? Do you go directly to your home after completion of your college in evening? Suppose you were a billionaire, how will you spend your time? If your parents forced you to leave home, where would you go? If you want to start your own business, what it would be? Hope you like our list of best truth questions for teenagers. If you know any other truth questions for teenagers, let us know in the comment section below. Break one egg on your head. Call someone and say nothing. Purpose someone of your same gender. Write my name in your WhatsApp status for one day. Send me a picture from your childhood. Put some powder on your hand and smack the person sitting beside you. Hug any tree near you. Write any Facebook status using your elbows and post it. Send a text message to your crush. Select any one thing in front of us and explain that item past, present and future. Full tank by bike or car. Play football with me for 2 hours. Run for 2 minutes and sing a rap song. Hope you like our list of best truth or dare questions for teenagers. If you know any other truth or dare questions for teenagers, let us know in the comment section below.